A Biblical image, re-read from the point of view of the Fathers of the Church, can help us introduce the discussion of the question that concerns us: what relationship does the Christian faith see between Israel and the Church? The question is indeed quite complex and could be addressed in a variety of ways: what is the reason for the significance and the continued relevance of Israel for the Church? Ought one to think of an economy of salvation based on a single covenant within which they both move, or is the covenant characterized by a plurality, and so the sense of the election and the significance of the promises is changeable and progressive? And finally  from a Christian point of view  is it right to ask questions as to the possibility and the modality of a close or remote conversion of Israel or ought we to conceive of a separate path to salvation for the chosen people? The image that helps us throw some light on this intricate forest of questions is that taken from the Book of Numbers where two explorers come back from the land of Canaan, bringing with them a pole from which hangs a cluster of grapes, which they accompany with the fruit of the pomegranate and the fig-tree: They also reached the Wadi Eshcol, where they cut down a branch with a single cluster of grapes on it, which two of them carried on a pole, as well as some pomegranates and figs (Num. 13, 23). In the pole carried by the two explorers the Fathers of the Church have chosen to see the wood of the cross, from which hangs Christ: Figura Christi pendentis in ligno, while in the two bearers, united and separated by this wood, they recognized Israel and the Church: Subvectantes phalanguam, duorum populorum figuram ostendebant, unum priorem, scilicet vestrum, terga Christum dantem, alium posteriorem, racemum respicientem, scilicet noster populus intelligitur. Since they march one behind the other, the one who goes in front only looks ahead of himself and therefore symbolizes Israel, the people of hope and the people waiting for the new and future things assured by God in his promises; the one who comes behind, on the other hand, sees the one who walks in front of him, as well as the horizon that the latter embraces, through the cluster hanging from the pole, and thus prefigures the Church, who in Christ crucified has the hermeneutical key of the ancient Israel and the promise made to the Patriarchs. Highlighting the difference, the image evidences nonetheless the continuity existing between the two people, not only because of the pole that both explorers bear, but also because of the common horizon to which their gaze is turned. The idea of continuity shall also be emphasized  with a later, poetic remark  through the supposition that the joy of desire lets both sing the same hosanna. United in the song of hope and expectation, Israel and the Church walk together, distinct and at the same time united by the Cross of Christ. Three elements of continuity together with discontinuity between Israel and the Church are here stressed in the dense Patristic reading: the eschatological character of biblical revelation in the First Testament as much as in the New Testament; the community-oriented notion of salvation, determined by the founding principle of the covenant between the eternal God and His people; the Messianic significance of the two peoples, of the one who waits as well as of the one who contemplates the fulfillment of the promises. What unites the two explorers as they walk is first of all the horizon to which their gaze is turned: the Truth for whose sake it is worth living is before their eyes. Towards this Truth they move their steps, it is this Truth that their heart seeks. But in order to be so, this very same Truth has come and has given itself up to the measure of the human possibility to understand it, has spoken the language of humanity, has enflamed their hearts of flesh with desire. The premise to the acknowledgment of the truth in the word of the living God is therefore, for Judaism as well as for Christianity, the possibility that the infinite becomes finite to communicate itself in the fragility of our words. This conviction is expressed by the Jewish Masters with a recurrent axiom: What is small can contain what is large. Christian wisdom uses very similar words: Non coërceri maximo, contineri tamen a minimo, divinum est . This conviction is at the basis of the doctrine of tzimtzum, central to Jewish mysticism, and of the idea of kenosis of the Word, which is at the center of the Christian message. when however they shall return, the Shekinah shall return with them. St. Francis invocation You are Humility (in Praises of the Most High God) indicates how this message deeply corresponds to the Christian soul, for which the highest confirmation of God pitching His tent in the fragility and smallness of the human horizon lies in the kenosis of the Word: The Word is said in this world by way of self-emptying (cf. Phil 2: 6ff. ), thanks to the act through which  in no way forced by the infinitely great  the Son has let Himself be contained by the infinitely small. This self-contraction is truly divine! This ecstasis of the divine, this going out of what is infinite into the finite, is at the same time the highest imaginable invitation to the creature to go out ecstatically from this world, to transcend all boundaries towards the Mystery, in a move that amounts to being rapt away by truth, and by that beauty that saves, a rapture made possible by the abbreviation of the Word in the flesh. The whole dwells in the fragment, the infinite erupts into the finite: the Crucified God is for the Christian faith the form and the splendor of eternity in time. On the cross, the Verbum abbreviatum (lit., the abbreviated Word) kenosis of the eternal Word- reveals the salvific potential of the smallest Infinite! Now, the presence of God amidst His people, His self-abbreviation to destine Himself to humanity, expresses itself above all in the Word (dabar). For the faith of Israel the Word of God is inseparably the Word that says, creates, saves. Even from a simple approach to the texts it is evident that the term dabar refers us to the noetic content, but also to the operative efficacy of the Word, which does what it says, exerting a profound impact on the transformation of the heart and on the events of history. The informative character is added to the performative character: it is in virtue of this density that one can understand how profound is the link between words and events in the economy of salvation. Thus, if on the one hand all the decisive stages of Israels history are introduced by the Word, on the other hand the faith of the chosen people can express itself simply through the narration of the salvific events, the mirabilia Dei, concrete manifestations of the Word of revelation (cf. Dt. 26: 5-10). In this light one may also understand the strongly dynamic and personal character of the idea of revelation driven through the experience of the Word in the history of Israel: the revelation through the Word is the advent of the living God in the sign of His words, the God who reaches and transforms the human condition, turning it into a history of redemption and salvation for all those who welcome the Word, but even into an experience of exile and condemnation for those who reject it. The gift of the Word according to the Christian faith touches its highest point in the event of the incarnation of the Word: And the Word became flesh and made his dwelling among us; and we saw his glory, the glory as of the Fathers only Son, full of grace and truth (John 1:14; note that even for the Word there is a Shekinah, a pitching a tent). In the succession of the times of the Word this is the fullness of time (cf. Mark 1:15; Gal., 4:4; Eph. 1:10), the hour when revelation is accomplished. The Word become flesh realized precisely the two meanings of the Old Testament notion of dabar: Jesus the Christ not only speaks Gods words, but is the Word of God, the eternal Word become human, which communicates itself and introduces us to the quickening experience of the divine depths in the gift of the Spirit. From the noetic/informative point of view, Jesus presents himself as the prophet and the master, who announces the truth about the Father and about human beings: No one knows the Son except the Father, and no one knows the Father except the Son and anyone to whom the Son wishes to reveal him (Matt 11:27). From the dynamic/performative point of view, Jesus is the Word become flesh, which has planted its tent in our midst (cf. John 1:14) and which speaks with the authority of the one who realizes what he says (cf. Luke 4:18-21). His person is so utterly inseparable from what he announces that to welcome his words is equivalent to welcoming him and the Father who sent him, while rejecting his words amounts to rejecting the salvation that he has brought (cf. Mark 16:15ff.). Judaism and Christianity are thus both faiths based on a response to the Word of God, religions of the Book entirely dependent on Scripture, despite the different ways in which they construe the fullness of divine self-communication. Ceasing to be a refuge, silence becomes the locus of the supreme aggression. Freedom invites God and man to the ineluctable encounter, which is the encounter of the opaque universe of silence. The times of divine Silence are the times of human freedom, because in their painful ambiguity they place man alone in front of his choices, wholly free from the God who withdraws Himself. The scandal of divine silence reveals therefore to Israel its God as the God of freedom, who does not guarantee anything, does not make assurances, but invites humanity to play and to risk everything in the work (mitzvah: precept), who does not give any final result for granted. Thus, it is the continuous intersecting of the divine Silence and of the Word of God that makes of the ethics of Judaism inseparably the ethics of freedom and the ethics of the pure Law, of the commandment loved even more than God, since God can withdraw Himself and be silent, but the Word continues to makes demands and to expect to be obeyed. To love the Torah more than God means to move towards the notion of a personal God. Even at the heart of the New Testament revelation, however, lies the language of silence: the Christian Gospel itself offers in full measure where the Silence of God reaches its abysmal apex, broken only by the cry of the ninth hour, on that Cross which is supreme scandal for the Jews, but is no less folly for the Gentiles, unacceptable compromise of God with human suffering. The God who has come among human beings did not offer Himself under the forms of human greatness and wisdom, but, on the contrary, annihilated Himself choosing what is weak and foolish to confound the strength and the wisdom of the world. The motivations of this radical absconditas Dei sub contrario (concealment of God under His contrary) are first of all those of negative theology: the negative vehicles the divine less inadequately, exactly because it excludes any confusion between human conceptions of greatness and the divine transcendence. But this motivation must be tied to a more properly Christological one, which is the effective absconditas Dei in Christ and in his cross: it is the dialectic of revelation, the self-manifestation of the divine in its contrary, according to the original meaning of the term re-velatio (second veiling). In Lain, the prefix re- has the double meaning of identical repetition and of change of status (analogously to the prefix apo in Greek): revelatio, like the Greek apokalypsis, simultaneously indicates a thickening and a falling of the concealing veil, the unveiling of what is hidden, and the re-veiling of what is manifested. The re-velatio, therefore, does not eliminate the difference between the worlds that through it come into contact: God remains God and the world remains the world, even if God enters into human history and humanity is given the possibility to partake in the divine life. This indicates that, if in revelation God manifests Himself in the word, beyond this Word, which is authentic divine self-communication, is and remains a divine Silence. The Word comes out of Silence and it is in Silence that it comes to be heard; as there is a coming of the Word from the silent Origin, so is there a destination, a taking place (advenire) of the Word, which is the locus of its Advent. The Word exists between two silences: the altissima silentia Dei (the deepest silences of God) of the Christian mystical tradition. It is precisely this dialectic game of Word and Silence that has been lost in the theological tradition of modernity. Indicative of this destiny, which has devastating consequences, is the very history of the word used to express the divine self-communication: from the moment when the term Offenbarung  evocative of the act of self-opening (etymologically: pregnancy, or disclosure of what is open, from offen, open, and the verb bären, which in Medieval German indicates the condition of bearing in ones womb, being pregnant)  has been accepted as the equivalent of revelatio in the language that controls the critical thought of modernity, the problem of revelation has become that of welcoming the manifestation of what is open, down to the Hegelian interpretation, where revelation becomes the phenomenology of the Absolute Spirit. From the perspective of the Offenbarung, the advent of God is conceived as an unrestrained self-exhibition: by saying Himself, the absolute Mystery would then hand over Itself to the worlds grasp; the entrance of the eternal in time would have turned history into the curriculum vitae Dei (the history of Gods life), the process undergone by God to become Himself. In this way, however, any continuity is lost with the original Biblical revelation, where the revelatio is the self-offering of the God who is revealed and concealed; always master of our desire, the God of revelation is the One who, giving Himself, simultaneously conceals Himself from our gaze and invites us into His silent and recollected depth. The God of the advent is the God of the promise, of the exodus and of the Kingdom. Thus His revelation is not a total vision, but a Word that discloses the abysmal paths of Silence. The renewed relationship with Judaism, that has a long expertise in the divine Silences, becomes therefore a precious school for Christian thought where the latter can re-appropriate the dialectical and eschatological idea of revelation, so as to retrieve the paths of Silence whence the Word comes and to which the Word leads. For Judaism, as well as for Christianity, the words in which the divine Word dwells are then to be searched in a continual process of transcendence, striving to reach the concealed Origin and the Advent which they preserve; and we can then understand why Judaism searches for the seventy meanings hidden in each one of Gods words and the Christian interpretation of Scripture looks out for its multiple meanings in an infinite game of allegorical and symbolic echoes. Thus the science of hermeneutics  intended as transcendence of the word, which alone searches for its deeper meanings, the vital worlds whence it comes and which it expresses  is born out of the Judeo-Christian tradition of the infinite reading of Scripture. If the gaze of the two explorers is always turned towards the ultimate horizon and towards the ultimate homeland, no ecstasis of completion, no seduction of possession can stop their journey. Judaism and Christianity are religions open to the abyss of the divine Truth, which is accessible in absolute obedience to the Biblical revelation preserved and transmitted by the holy people. Inasmuch as He demands the effort of an inexhaustible interpretation, one can say that the God of Judeo-Christian revelation is not the God of easy and ready-made answers, but an exacting God, who in the act of love and self-donation simultaneously conceals Himself and calls us to leave ourselves behind in an exodus without return which leads into the abysses of His silence, which is the first and the last: a God who makes those who love Him think. The relationship with Him necessitates therefore to be lived in a living community, which, preserving and acknowledging His language, could then teach it to its members, so that they could preserve it and creatively transmit it in their own turn. This community is the people of God, the qahal of Israel, the Church of the disciples of the One who was crucified and has risen, both established and sustained by the words of the sacred language, in which Gods revelation is forever fixed. The value ascribed to this linguistic-communitarian belonging depends not on the language effectively used in the ordinary life of the believers, but on their constant and necessary learning of Gods language through the words  transmitted and faithfully translated from the sacred original  in which the Word said itself. To belong to this community is not a sacrifice of the intellect, but a hermeneutic condition for its fecund exercise: the faith that unites all believers is food that nourishes our asking and our listening, as well as womb that receives, preserves and interprets our understanding of the Word of life, which is an understanding encompassing the whole of reality. We can now understand the care with which Judaism and Christianity have always affirmed and preserved the language of their divine origins: the question which language was spoken in the Garden of Eden by Adam, Eve, God and the serpent? For the Jew, as well as for the Christian, this is only apparently a rhetorical question. The answer of Augustine  who unhesitatingly indicates Hebrew  is meant to tie the language of the first Adam to the language of the new Adam, Christ, to show that in Him is accomplished the new creation: in reality, however, the theological density of the claim has even wider consequences, since the unity of language expresses the unity of Gods people and establishes on one hand the mutual communion of the believers in the Israel of the election and the Church of the disciples, while on the other hand it lays the foundations for the providential relation between Israel and the Church. The proof of what I am saying is the fact that, when anti-Semitism gained the upper hand in the conscience of the Christians, other answers did emerge to the question of the language of Eden, thereby confirming that, as soon as one loses the unifying strength of the language created by God to say Himself to mankind, the truest identity of His people in history is also lost. For Judaism and Christianity this belonging to the holy people constitutes the hermeneutic circle that most fully introduces to the treasures of Truth: far from mortifying reason, the shared faith stimulates and exalts it. In Gods salvific design, Israel has a decisive and central role as people and the Church itself cannot comprehend its own identity and its own mission without situating itself in relation to what Paul calls the holy root (Romans 11:16). With a daring image, which manifestly contrasts with what is experienced, the Apostle sees the wild olive shoot grafted onto the olive tree, and not, as would be natural, the good plant grafted onto the wild one: this reflects the decisive importance that Paul ascribes to the Jewish plant, not hesitating to remind the Christian community that it is not the latter that bears the root, but rather the contrary (Romans 11:18). The very refusal of Israel is considered by the Apostle as a providential condition so that salvation reaches out to the Gentiles (v. 11), who in their turn shall make Israel jealous and eventually lead to their re-integration (v. 14). The deepest motive for this mysterious design is located by Paul in the faithfulness of the God of the Covenant: For the gifts and the call of God are irrevocable (v. 29). The complex history of the theology of salvation, which undergirds these reflections, affirms therefore the continuity between Israel and the Church, no less than the novelty, which constitutes the people of those who believe in Christ. To think through the relation between the two peoples within Gods salvific design, as well as their specific roles in it, is thus the question that remains open, and that ever since the beginning of Christianity was posed to our conscience of faith, a faith always sustained by a God faithful to His promises. The continuity is manifest first of all at the level of language: the very terms Church and people of God have Old Testament roots. The community of Israel is indicated with the virtually equivalent expressions edah and qahal, of which the former evokes a community gathered together, while the latter emphasizes the active moment of convocation. The Septuagint shall usually translate these terms with synagoge and ekklesia, and it shall be the latter expression  indicative of the religious moment when the assembly of the Lord is established  that shall become of common use to indicate the community gathered by God through the announcement of the Paschal faith (Church of God), also because in a Greek context the term synagogue had become the proper name of the Jewish religious community and of its place of gathering. The distinction between am and goyîm, designating respectively the chosen people and the other peoples, was translated into Greek by means of the two terms  which had entered the language of the New Testament  laos and ethne, used to indicate the people of God on the one hand, and the pagans  or the Gentiles  on the other. Already this terminology shows the extent to which the Church understood itself in continuity with Israel. Like Israel, the Church views itself as a people living in a condition of exodus, gathered in the twelve tribes: But now I am standing trial because of my hope in the promise made by God to our ancestors. Our twelve tribes hope to attain to that promise as they fervently worship God day and night; and on account of this hope I am accused by the Jews, O king! (Acts 26: 6-7). The choice of the Twelve (cf. Mark 3: 13-19 and the synoptic parallels) indicates how Jesus himself understood his community in continuity with Israel: and how his community lives its eschatological hope consistently with this understanding (cf. Acts 21: 12-14). Jerusalem  seen in the Jewish tradition as the gathering point of those who are dispersed and as the holy place of the salvation accorded by God  remains in the consciousness of Christians the eschatological city that descends from the heavens (cf. Gal. 4, 26ff. ; Acts 21, 2), while at the same time it is also the historical center where the redemption is accomplished and where the preaching of the gospel to all the peoples began. Even the New Testament idea of the kingdom of God, content and heart of Jesus preaching, is deeply rooted in the Old Testament; and in the same way as Israel is not identified with the reign of the eternal One, the Church knows that it is only the seed and the warrant of the kingdom (cf. the parables of the kingdom in Matthew 13). Before everything else, however, it is the relationship with God that is the chief element of continuity between the communities of the old and of the new testaments: both are the people of God. The eternal One destined Himself for Israel in the bond of the covenant: and Israel acknowledges that it exists because of Him and for Him, as His own property, His ally, His refuge among the people, a priestly kingdom and a holy nation (Exodus 19:6; cf. 1 Pt. 2:9 and Acts 5:10). It is similarly the experience of salvation that gives to the Church the conviction that it is the people of God, conceived with the same category used for the chosen people: flock, field of God, chosen vineyard, Gods edifice, His dwelling place, holy temple, Jerusalem that is above and our mother (Gal 4:26; cf. Acts 12:17), bride whom the Lord loved and for whom He handed Himself over so as to sanctify her (Eph. 5:25-26). And in the same way as Israel acknowledges its mission to be the people among the peoples, sign and instrument of the salvation of the eternal One for all the peoples, even if in a constant tension between particularism and universalism, so the Church shall see herself called to bring the message of salvation even unto the ends of the earth, as a sign lifted up among the nations (cf. Mark 16, 15ff. ; Matthew 28, 18-20). And as Israel lives in the vigilant and hopeful expectation of the fulfillment of the promises of God, so the Church is the people of hope, in a tension between the already of the gift of the Lord and the not yet of the universal shalom (cf. for instance 1 Cor. 15: 20-28; Acts 22: 17-20). Thus- remarks St. Thomas Aquinas- the Patriarchs of the old covenant belonged to the same body of the Church to which we belong now. Is it then possible to say that there is a single covenant, from which the only people of God in history is born? The continuity between Israel and the Church seems to authorize us to think in these terms: and the decisive argument would be the irrevocability of the election and the faithfulness of the eternal One to the covenant established with His people. Exactly because they are both people of God, the communities of the First and of the New Testament, united in a single plan of divine grace and mercy, would then be one single people journeying towards the same eschatological homeland, and called to an identical task of Messianic witness. The event of Christ would then not constitute a rupture, but a deepening and above all a broadening, in virtue of which the encounter with the God of Abraham, of Isaac, and of Jacob shall be made possible for all peoples. In this perspective, the schism that has historically taken place between Israel and the Church would not be in line with Gods intended plan, according to which the two communities ought to continue to fulfill their task in reciprocal communion under the sign of the one single project for the salvation of the world: Israel as root, enduring testimony of the mystery of election that sets apart and consecrates; the Church as tree, whose branches reach out to the wind and to the sun in the space of time, which is always fecund in ever new seasons. Jesus Christ, especially in His aspect of suffering Servant and of crucified Messiah, would then be the link between the two communities: synthesis of the history of suffering of the chosen people in His passion, source of the mission reaching out towards the fulfillment of redemption in His resurrection. From this point of view, in Him, Torah made flesh (J. Schoneveld), the deepest meaning of the Law has become transparent to all the peoples: and this meaning is the injunction to live in the presence of God as authentic images of Him. For the Christian faith, Jesus is the Messiah expected by the Jewish hope, fulfillment of the promises made to the Patriarchs and at the same time promise of a new and definitive fulfillment, which shall be consumed in the glory of the eschaton. In this sense, the Church knows that it bears in itself the hope of Israel, as it is waiting for the full realization of the Messianic promise: and at the same time, it is aware of its difference from the people of the old covenant, because it acknowledges that the end times have already started in the history of Jesus, Lord and Christ, and because it views itself as receiving and simultaneously as enacting this eschatology that is about to be realized. The awareness of this novelty, even in continuity with the people of the Old Testament, is clearly enacted in the New Testament: the Church sees itself -in contrast to the Israel according to the flesh (cf. 1 Cor. 10:18)  as the Israel of God (Gal. 6: 16), issue of Abraham and heir according to the promise in virtue of the fact that it belongs to Christ, the Messiah who has come (cf. Gal. 3,2 9 and Romans 9, 6-8). The fact that this novelty is emphasized leads one to think of two covenants: the Old Testament is followed by the New, while the economy of the Sinaitic covenant is replaced by the new and eternal covenant ratified by the blood of Christ on the cross. . The two explorers of the Land of Canaan shall therefore continue to walk towards the same destination, mysteriously united by the Cross of Christ and by the same song: not one against the other, nor simply one next to the other, but the one for the other, both turned towards the eschatological fulfillment of the promises of God. But how shall this come about? The decisive claim consists in the acknowledgement of the historical-salvific peculiarity as well as of the permanent religious significance of Judaism as a crucial datum for the Christian faith. To have forgotten or neglected this fact, which finds its basis in the convictions expressed by Paul in his Letter to the Romans (ch. 11), has been the cause of immense suffering for the Jewish people, made the target of rejection and persecution that culminated in the tragedy of the Holocaust, but has also resulted in the impoverishment and alienation of Christianity itself. One understands at this point why many of the interpretations proposed in the past to understand the relationship between Israel and the Church must be abandoned or left behind. From the historical point of view, the interpretive models whereby the Christian community related itself to the Old Testament have gone from the dualism of opposition between the Old and the New Israel to the simple allegory of substitution or the instrumental use of the testimonies of the Old Testament, finally to move on to the search for an authentic complementarity. The dualistic model opposes the New Testament to the Old: Marcion and the heretical movement that drew inspiration from his thought, developed around the middle of the 2nd century, are its most emblematic representatives, with their thesis expressed through a forced reading of Luke 5: 36-39: One does not pour the generous wine of the Gospel into the old wineskins of Judaism. In this perspective, the work of Jesus would have consisted in freeing people from the oppressive domain of the Law and from the implacable divine justice, so as to offer them the good news of mercy and forgiveness, reaching also those who are far through the supreme, loving gift of His death on the Cross. In the Antitheses, whereby he prefaced the Biblical canon that he had established, Marcion classified and selected the texts of Scripture on the basis of this fundamental dualist criterion, thinking that in this way he could demonstrate the cruelty of the God of the Jews, against which the superiority of the Gospel would shine all the more. Because of its tendency to exalt the novelty of the Gospel, because of its strong Paulinism, and because of the radical nature of its judgments, Marcionism, though officially condemned by the Church, would go on to exert a great influence on Christian religious consciousness, and would doubtlessly be one of the remote causes of the anti-Semitism that shall not cease to beset the Church. The gnostic inspiration behind it, in virtue of which revelation is subjected to a more or less arbitrary assessment based on a rationally established criterion, shall however lead many to the realization that a dualistic model of interpretation is ultimately incompatible with the religious consciousness of the Church, which could not tolerate the cancellation of the Old Testament as it would thereby lose its own roots. In the dualistic model there is a logic of opposition, while in the allegorical model there is a logic of effective substitution. In the so-called anthological model, what prevails is a process of integration: the rest of Israel, seen as the best that the Old Testament was able to express, is taken up and integrated into the spiritual identity of the Church. What takes place here is again an instrumental use of the Old Testament and of its testimonies: one resorts to them in full respect of their historical significance, but one does so selectively, privileging what seems more universally valid or what appears more easily interpretable in a Christological key. Here, Israel is not completely denied, but there is an effective partial cancellation. Even here the risk that emerges is the emptying of the Old Testament and its pure and simple assimilation to the New. An interpretation in this direction of the formula the New Testament was concealed in the Old, the Old becomes manifest in the New would again suppress the dynamism whereby the divine economy is realized, weakening the historical character proper to the Judeo-Christian understanding of revelation. The origin of this interpretive approach in actuality appears to go back to the fact that, when the New Testament canon had not been determined or fixed, the Christians strove to discern the history of Jesus, center and foundation of their faith, in the only canon at their disposal, that of the Old Testament. From here to the apologetic interpretation of the Old Testament it would not take long. What is therefore to be preserved in the relationship between the Church and Israel is the value of the Old Covenant in itself, as well as the permanent religious significance of Israel, postulated by Paul on the basis of Gods faithfulness to His covenant. Here we see emerging the model of complementarity: the Old Testament has a structural value, appropriated in fact by Jesus Himself, Jew and actually Jew forever. The vision of reality, characteristic of the holy root, consists in a fundamental element, which the existence of the Jewish people has continued with tenacity to witness in history, despite all attempts at assimilation or suppression perpetrated against them. This element, true center and heart of Judaism, is the covenant with God. Everything for the Jew refers back to the Covenant: the good and beautiful world of creation, the difficult freedom of the human condition, the destiny of the  no matter how unfaithful  chosen people. By listening to the eternal One as demanded every day and more than once a day in the Shema, everything is oriented to Him, Who is to be loved with all ones heart, in other words in the midst of the conflicts that go through this source of life, which is attracted to good and to evil, with all ones soul, unto the gift of oneself, with all ones strength, without sparing any of our abilities (cf. Dt. 6:4ff.). Jesus himself lived this spirituality of the covenant: he is the New Adam, who obeys where the other has failed. Jesus is the yes to the covenant (cf. 2 Cor. 1:20), the fulfillment in his very person of the covenant of eternal love between God and his people, the Israel realized according to the heart of God. The New Testament truly realizes (lit. incarnates) the Old Testament in the sense that the covenant fulfilled in Jesus makes it possible to understand the Covenant in the fullness of its truest meaning. There is no question of one or of two covenants: the economy of the Covenant is one and consists precisely in the plan of Gods love for His people, the plan which Paul calls the mystery kept secret for long ages (cf. Romans 16:25). The times, however, as well as the forms and the degree of realization change: the covenant with Noah is not the covenant with Abraham, and the latter is not yet that of Sinai. The covenant of Golgotha and of the resurrection does not negate the earlier covenants, but brings them to fulfillment. Thus between the two people of the economy of the covenant there can be nothing but complementarity: the New clarifies, the Old lets itself be clarified, but in its turn is also itself indispensable to understand the light of the New. Thanks to this hermeneutic function, in the light of the New the texts of the Old Testament shall be sometimes fully assimilated, sometimes put in perspective, sometimes referred back to the absolute priority of the love of God; nor shall the novelty of the incarnation of the Son, which surpasses every expectation, ever be forgotten. The Old Testament, however, endures  in its structural value, and in its fundamental way of seeing the world, humanity and history in the light of the covenant with God; and this explains why the survival of Israel, tenacious witness among the people of this vision of the world, is neither a threat nor an impoverishment, but indeed a true resource for the Church, while the Church, people of God, does not eliminate what came first, but constitutes the permanent, respectful and trusting offer of the possible fullness. 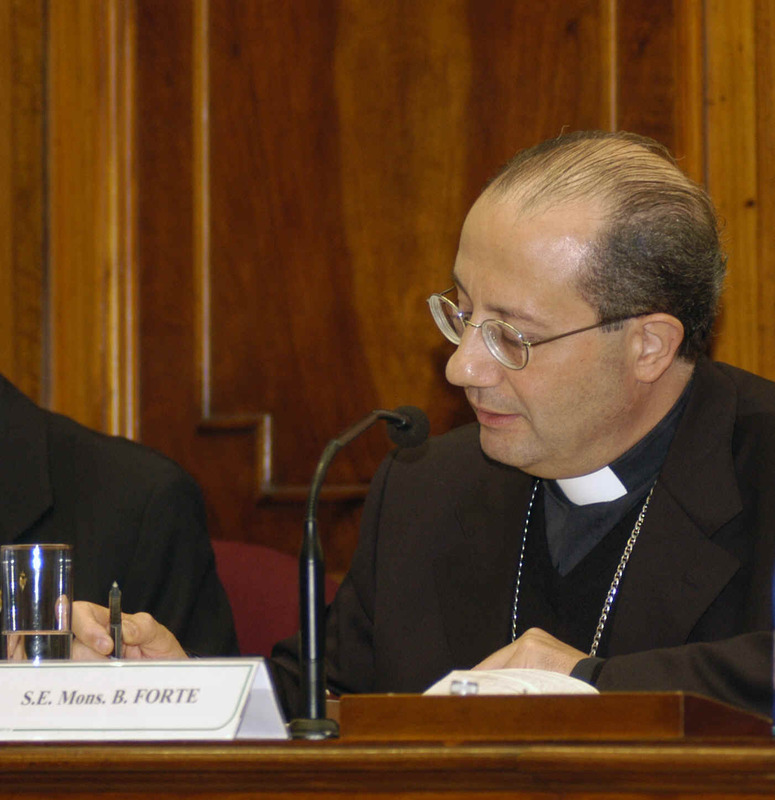 Therefore, since the common spiritual patrimony shared by Christians and Jews is so large, the Second Vatican Council thought it fitting to promote and recommend among the two peoples mutual understanding and esteem, which can be especially attained by Biblical and theological studies and by fraternal dialogue. Leaving aside individual spiritual journeys that are always possible and that are rich in prophetic spirit, the two people, like the two explorers of the Promised Land, shall always walk together in a sort of reconciliation process that is always in fieri, until the time when they shall converge in the single people of the eschatological time, which the Christians expect as the full fruit of the reconciliation accomplished in the blood of the Crucified and Risen Messiah, sign lifted up to draw all the peoples in the universal pilgrimage of the nations towards the Jerusalem of the final consummation. A type of Christ hanging from the Cross.So claims for instance Evagrios (the Historian) around 430 in Altercatio inter Theophilum et Simonem, PL 20, 1175. Cf. H. Leclerq, Dictionnaire dArchéologie Chrétienne et Liturgie, 3, 169-170; C. Leonardi, Ampelos. Il simbolo della vite nellarte pagana e paleocristiana, Roma, 1947, 149-163. The two bearers of the pole indicated a type of the two peoples, the one in front representing your people turning his back to Christ, the one behind representing our people looking at the cluster of grapes. Thus again Evagrius, Altercatio inter Theophilum et Simonem, PL 20, 1175. The same ideas are in St. Maximos of Turin (middle of the 5th century): Hom. 79: PL 57, 423ff. Y. Congar, Ecclesia ab Abel, in Abhandlungen über Theologie und Kirche. Festschrift Karl Adam, Düsseldorf 1952, p. 103, n. 65, refers to Pietro of Mora (Capuano: 1242) and to Adam of St. Victor. The allusion is to Mark 11, 9: Qui praeibant et qui sequebantur clamabant dicentes Hosanna (those who were going in front and those who followed cried out saying Hosanna). Cf. Genesis rabbah V.7 and Leviticus Rabbah X.9, referenced in G. Busi, Simboli del pensiero ebraico, Einaudi, Torino, 1999, p. 391. What is not subject to anything greater, but can be contained in what is smallest, is divine. Cf. H. Rahner, Die Grabschrift des Loyola, in Stimmen der Zeit 139, 1946-47, pp. 321-339. This sentence, quoted in Imago Primi Saeculi Societatis Jesu, Antwerp 1640, p. 280, as Elogium sepulcrale S. Ignatii, was used by Hölderlin in 1794 as opening for the novelistic fragment Hyperion. See the presentation of this tradition in G. Scholem, Schöpfung aus Nichts und Selbstverschränkung Gottes, Eranos Jahrbuch 1956, pp. 87-119. Cf. also G. Scholem, Le grandi correnti della mistica ebraica, Einaudi, Torino, 1993, p. 270ff. After having noted the Kabbalists overturning of the notion of a contraction of the divine presence on Mount Zion (divine contraction ad extra) through the doctrine of the divine contraction ad intra, Scholem notes: One is tempted to interpret this withdrawal on the part of God into His own being in terms of exile or banishment from his utter omnipotence into the deepest solitude. Considered in these terms, the notion of tzimtzum ought to be the deepest thinkable symbol of exile. Cf. A. Neher, Lesilio della Parola, op. cit., p. 146. On the theology of the relation between the Church and Israel, cf. among others: A. Bea, La Chiesa e il popolo ebraico, Brescia, 1966; N. Lohfink, Lalleanza mai revocata. Riflessioni esegetiche per il dialogo fra Cristiani ed Ebrei, Brescia, 1991; F. Mussner, Il popolo della promessa. Per il dialogo cristiano-ebraico, Roma, 1982; F. Mussner, Die Kraft der Wurzel. Judentum-Jesus-Kirche, Freiburg-Basel-Wien, 1987; C. Thoma, Teologia cristiana dellebraismo, Casale Monferrato, 1983. J.T. Pawlikowski, Judentum und Christentum, in Theologische Realenzyklopädie, Band XVII, 3/4, Berlin-New York, 1988, pp. 386-403, supplies a comprehensive bibliography as well as an exhaustive survey of the various positions. Et ita Patres antiqui [veteris Testamenti] pertinebant ad idem corpus Ecclesiae ad quod nos pertinemus, St. Thomas Aquinas, Summa Theologiae III, q.8, a.3, ad 3 (Utrum Christus sit caput omnium hominum, On whether Christ is the head of all people). Cf. G. Scholem, Concetti fondamentali dellebraismo, Genova, 1986, pp. 107ff. Cf. J. T. Pawlikowski, Judentum und Christentum, op. cit., pp. 398ff. ; this is the position of the theology of the two covenants, which goes from the rather simplistic oppositions of J. Parkes (the experience of Sinai destined to the community, that of Golgotha destined to the relationship between the individual and God), to a wide variety of intermediate positions, among which one ought to highlight that of C. Thoma, Teologia cristiana dellebraismo, Casale Monferrato, 1983, who evidences the choices made by Jesus Himself among the various forms of Israels Messianic expectations (which were far from homogeneous), and sees the novelty of Christianity in the fact that the Prophet from Galilee announces the advent of the kingdom of God and connects it to His person and His work, and that of F. Mussner, Il popolo della promessa. Per il dialogo cristiano-ebraico, Roma, 1982, and Die Kraft der Wurzel. Judentum- Jesus-Kirche, Freiburg-Basel-Wien, 1987, who sees the novelty in the deepest relationship of unity between Jesus and God, and thus in the Incarnation, which is read as a radicalization of the promise, rather than as its realized fulfillment. To support his claim, Mussner reminds us of the anticipation of the Christology of the Son present in Old Testament Wisdom literature (cf. pp. 380-389). Cf. C. Thoma, Teologia cristiana dellebraismo, op. cit., pp. 204ff. Cf. op. cit., the hypotheses put forth in Part 3: pp. 162ff. and pp. 188ff. Cf. C. Di Sante, LAntica e la Nuova Alleanza. Il rapporto tra i due Testamenti, in Israele e le genti, op. cit., pp. 53-71. Thus J. Isaac, in Gesù e Israele (1948), Firenze 1976, p. 86, synthesizes this position. It is the persistent influence of the Marcionite mentality that might make the use of the term New Covenant equivocal: cf. N. Lohfink, Lalleanza mai revocata, op. cit., pp. 17ff. Cf. A. von Harnack, Marcion: das Evangelium vom fremden Gott, Leipzig 1924/2. Cf. also the information given by Ireneus of Lyon in Adversus Haereses, I, 27, 1-3, classifying Marcion amongst the Gnostics. Cf. St. Augustine, Quaestiones in Heptateuchum 1.2, q. 73: PL 34, 623: Novum Testamentum in Vetere latebat; Vetus nunc in Novo patet. Cf. Nostra aetate, 4. Cf. for a collection of the most important documents L. Sestieri-G. Cereti, Le Chiese cristiane e lebraismo, 1947-1983, Casale Monferrato, 1983. Cf. also M. Pesce, Il cristianesimo e la sua radice ebraica. Con una raccolta di testi sul dialogo ebraico-cristiano, Bologna, 1994, including a presentation and a commentary of the official documents of the Church from the Second Vatican Council onwards.